What do you believe? Do you believe that the Eurobond loan was stolen? Misappropriated? Or used as initially intended? On the allegations that the Eurobond was stolen, the Ethics and Anti-Corruption Commission and the Director of Public Prosecution have reported that no one is culpable on Eurobond theft, and they have recommended to the Auditor General to tell Kenyans how the Eurobond money was used. I personally believe that the Eurobond was misappropriated – that is it was directed to fund expenditures that it was not initially meant to do. Instead of being appropriated to fund infrastructural development, the money was used to repay syndicated loans (acknowledged by the Government) and fund recurrent expenditure in almost all Ministries (also acknowledged by the Government). The repercussions of the misappropriation of the Eurobond were seen in most parts of last year when the interest rates skyrocketed especially in the third and fourth quarters of 2015, increased inflation, the weakened shilling against the dollar that hit its lowest in the history of Kenya, and the inability of the Government to fund most of its operations, including inability to buy consumables for institutions like Parliament. Although the Eurobond was meant to shield the Government from domestic borrowing so as to stabilize interest rates, the failure of the Eurobond to do its work forced the Government to borrow huge amounts of money from domestic market, and this meant that between October and December last year interests on loans reached their highest at 30% in most commercial banks. It is not clear the amount of money Kenya intends to borrow, but I would assume it is still in the range of shs 200 billion. If the new Eurobond loan sails through, then the country’s debt will surpass the already all time high debt of 3.16 trillion shillings. 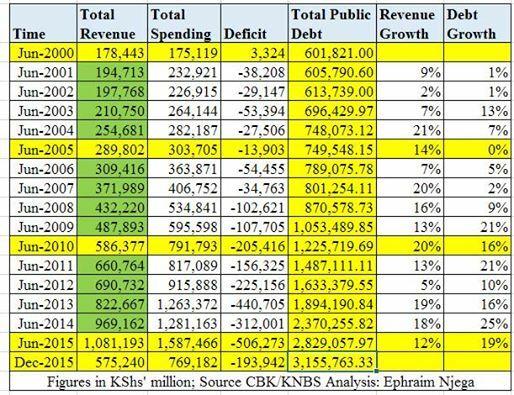 An analysis by Ephraim Njenga on Kenya’s Revenue collection, Spending, and Public debt revealed that since 2013, the country’s debt growth has been in the double digit percentages, recording an all time high of 25% in 2014. His summary table is provided below. Although interest rates went down towards the end of December to date, followed by decline in inflation rates from February 2016, economists say that interest rates and inflation is not yet stable due to repayment pressure the Eurobond and other loans have on the Government. Given that Kenya Revenue Authority’s collection for the eight months to February 2016 left it with a deficit of shs 527.88 billion against a target of shs 1.21 trillion and with only four months to go, the loan repayment pressure means the Government will be left with no option other than to dig deeper into both International and Domestic borrowing – but again not for any significant infrastructural development, but to fund recurrent expenditure. The Government has already taken to the International Markets to seek a fresh Eurobond Loan, and probably at below 10% interest rate, and is likely to get yet another huge loan that will increase our loans book probably by over 25% debt growth, but wouldn’t it be appropriate for the Government to first account on the achievements the initial Eurobond loan made to the economy? The initial Eurobond was also meant to enable the economy grow by over 10%, but the 2015 economic growth of 5.8% was actually below Government promises even if the Eurobond was not considered. The question every Kenyan must ask is, why is it so hard for the Government to meet revenue collection targets? Are taxpayers evading paying their taxes? Is KRA incompetent? Corrupt? Instead of the Government opting to easily borrow both from the Domestic and International markets, why doesn’t it seal the revenue collection loopholes? Even if it means firing all the KRA commissioners and staff? If there are leaks in revenue collection channels, it doesn’t matter how frequent the Government borrows, we will still need to repay those loans from revenues collected, and therefore we should never want to hear of news that the Government cannot meet revenue collection targets.